Autogeek or not, you should know that detailing is an important process if you want your car to perform better and last longer. One important tool that is going to impact the detailing result is the car drying towel. It’s true that auto detailing pertains more to the washing, waxing, and polishing steps but drying is essential to the overall result as well. If you want your ride to be free from water spots and scratches, using the right car drying products is important. That’s why the auto world is experiencing a microfiber madness right now, and debating about which one is better: chamois or microfiber. If you want to know more about these products, just read on. You’ll be able to learn the different towel varieties best for car care, their pros and cons, discover the best products to get as well as tips and buying guides! What Is a Chamois Towel? How to Use a Shammy? If you want only the best car cleaning services for your car, then it’s a definite that you will need only the most premium car products. Yes, it’s true that you can repurpose your best-used bathroom towels to save money. You can even opt for other types like huck towels and sponge cloths but not all of them may perform as successfully as more specialized towels like the waffle weave kind. Buying specialized towels might still prove to be more cost-efficient. Plus, you’ll be sure that it won’t scratch your paint and will leave your paintwork with a deep, reflective shine that will make anyone jealous of your car. Below are some of the best car drying towel for you to check out. Buying a great drying product is as easy as going online if you don’t want to drive to your nearest hardware store. Amazon has a wonderful selection of car detailing tools that can help you achieve amazing results in your auto projects. If you don’t want to experience swirl marks and other ugly imperfections on your car’s surface and want to dry your vehicle properly, you will need to get a reputable brand. In today’s time, microfiber is considered to be the industry standard for car drying. It goes to say that if you’re looking for the best car drying cloth, only the best microfiber towels for auto detailing will do. 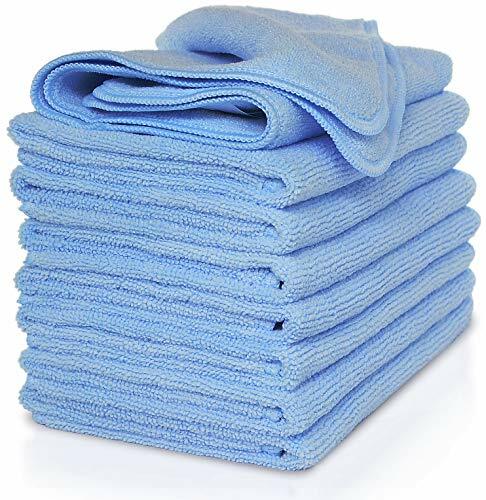 Microfibers are known for their super soft and equally, absorbent towel features, making them amazing in removing polishes, waxes, and dirt without leaving unwanted blemishes. With this premium towel from Chemical Guys, you don’t need to worry about the long process of car washing. It works fast and remarkably well with quick detailers and waterless washes so your ride will be spick and span in a matter of a few minutes. It can easily compete with the high absorption qualities of other cloths because of its 360,000 microscopic strands of microfiber sewn in a durable loop weave. This allows the towel to absorb almost 10 times its weight in water. Plus, it’s lint-free so no leaving of irritating fibers behind. It’s also conveniently machine washable, making for easy cleanup after your project’s done. But what makes it amazing is the unique silk edges it has that makes it glide smoothly on any surface without leaving any scratch. What’s better than a microfiber towel, you ask? Well, a microfiber towel that’s in an extra large size is a pretty good answer! At 24 inches by 60 inches, this Relentless Drive towel can easily dry your car on its own. No need for multiple towels and incessant swiping back and forth. Like most microfiber cloths, it is super soft and will give your car the gentle cleaning it deserves. Scratching your paint is almost impossible with this type of towel so start wiping down with no worries. You can even use it on vehicles other than your beautiful cars. Try it on smaller types like your bicycle and motorcycle. Or attempt to clean bigger ones like your RVs, boats, and your airplane if you have one. The huge size of this towel will ensure that you get more surface covered in a shorter amount of time. It’s a good investment to get as you won’t be stuck with disposable towels anymore. This XL towel is highly reusable because it’s machine washable and can last a long time. Not will you save more money because you’ll be buying fewer towels, but you’ll also be helping the environment more by sticking to one towel for a long time. Like many other great brands, this VibraWipe microfiber cloth is excellent in absorbing water so you’ll be needing fewer towels to dry the entirety of your car. It can soak up more liquid and can be wrung out more easily making for quicker drying time. Plus, it is made with an 80/20 variety, meaning 80% polyester and 20% Polyamide which is one of the two best combinations of microfiber varieties in the market today. This split microfiber can pick up more dust and dirt before it needs to be rinsed out. Plus, you don’t need to worry about the dreaded triple S: swirls, scratches, and streaks. Since this awesome towel is lint-free and streak-free, it’ll leave no unwanted fibers and imperfections behind. Plus, this feature makes it one of the best polishing cloths for cars. You wouldn’t even break your budget by buying this at it comes at a very affordable price for a pack of 8 pieces. By purchasing this towel, you’ll be able to save up for better car products to use. Car detailing products often practice the more practical side of advertising. They opt for straight to the point and informative. This brand knows how to stand out and look different. They talk a big game when selling themselves and make them sound like the best car chamois towel you can ever ask for, and for a good reason. Hyping this product up seemed like a pretty easy job because it’s as impressive as they say it is. Now, if you’re looking for a leather shammy for a dry car process, this might not be the one you want. The Man Sham is a synthetic variety of the chamois and is made up of polyvinyl alcohol (or PVA for short). It absorbs a lot of water, even more than the highly absorbent leather chamois. Think of it as a higher level form of sponge (but in a smooth towel form). You don’t even need to worry about fibers clinging to your beautiful finish because the best chamois cloth such as this is lint-free. You don’t even need to put as much effort as you normally do because the Man Sham can do the work of 5 cotton towels with no problems. What more can you ask for in the best chamois for drying a car than high water absorbency and easy wring out? This is definitely one of the best chamois cloth! Plus, you’ll be letting the sheep keep their skin for a while longer since this product doesn’t use animal leather. You don’t need to prepare it before using like real chamois since it’s ready to go as soon as you pick it up! 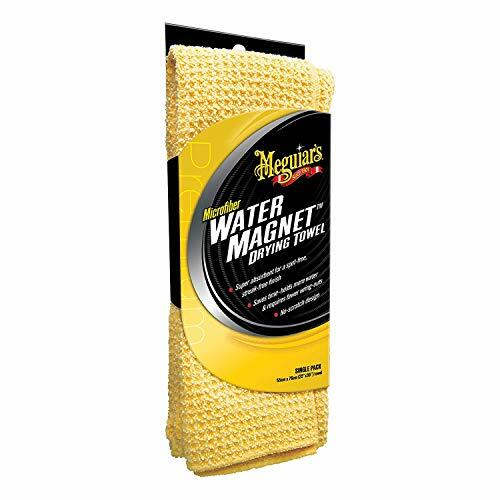 Another great Meguiar product to try out is their X2000 Water Magnet. Just by looking at the brand, you know that this towel will perform great and will probably a worthy contender for the title of the best microfiber car drying towel. 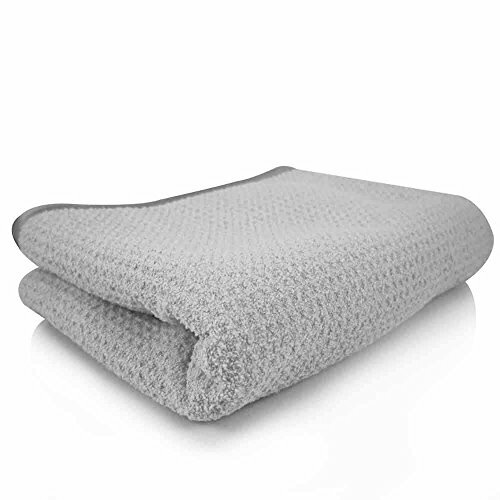 It comes in a huge 22 inches by 30 inches size and is sewn in an innovative waffle texture which can absorb more water than a regular microfiber cloth. It can easily absorb two times more water than regular terry cloths and will leave your finish spot-free without even streaking in the slightest. Plus, it requires fewer wring-outs and dries faster than most towels so you’ll be able to shorten the car detailing time quite significantly. This leaves you free to do other stuff you love! Another great towel from another great brand, this waffle weaved cloth is extra soft with and very high absorbency rate. It is also very gentle and easy to use as it is scratch-free, lint-free, and swirl-free. You’ll have an amazingly shiny ride in no time with this product. It can be used with glass cleaners and detail sprays as well as removing traditional pastes and creams. Use this awesome towel for your cars, motorcycles, trucks, and SUVs. You are even provided with added protection because of its amazing silk banded edges. Plus, it’s 100% machine washable so you don’t need to worry about the effort of cleaning up after. If you want a premium microfiber in your detailing arsenal, this one by CarCarez is created with 450gsm microfiber which is unparalleled in its softness, absorbency, and durability. You can instantly feel it when you touch it. 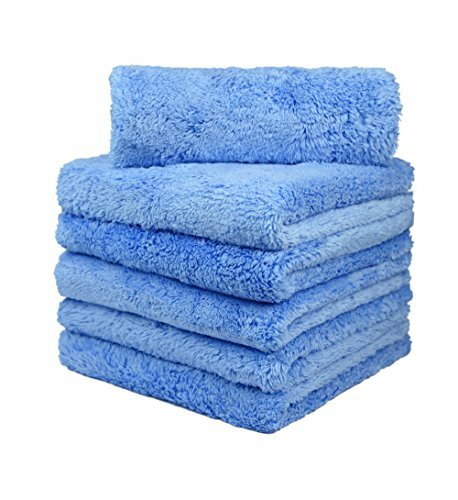 This towel is thick and plush and will feel like the high-quality product that it is. It is a great towel to have if you don’t like assigning a specific task to specific tools. This towel works great for car washing, drying, window cleaning, polishing, waxing, buffing, and finishing. Plus, it works great for interior and exterior detailing. You can even use it with a variety of car products. It works amazingly with waterless washing tools, quick detailers, waxes, compounds, and sealants among many others. Plus, it doesn’t have any tags and seams that might scratch your paint. Its sonic cut edge allows it to glide smoothly on your car’s surface. It also comes in a nice light blue color which helps highlight dirt picked up so you can avoid wiping the dirty side back on your finish. This Viking towel boasts of millions of tiny fibers weaved together to create a top-notch towel that can easily grab and hold dust and dirt better than a lot of other products in the market today. It is wonderfully soft and equally as absorbent (more so than cotton). In fact, it can absorb three times its weight in water with no problems at all. It is safe to use on your clear coats because it is lint-free so not pesky fibers will be left behind. Its amazing softness also makes it a great and gentle towel to use even without any chemicals to help it. Plus, it is sewn in a waffle weave pattern which is tighter than the usual weave for microfibers. This allows for the higher absorbency rate and the better wring-out performance. By using this towel, you’ll be lessening your drying time considerably. It also features a great capillary action that can draw water faster from the surface and its micro-bead properties allow for no streaks and water spots to be left behind. It is also machine washable and reusable. Not only are you saving money, but you’re also helping in lessening global waste. Its durability will also guarantee that you won’t need to change towels for a long time. Who says cute and fluffy can’t do an excellent job as a car drying towel? Well, they’re about to be proved wrong with this innovative towel created by the Rag Company. The name itself is a dead giveaway that this product is no ordinary towel. The PLUFFLE is a combination of plush and waffle. Some of you might be doubting how a plush towel can perform well as a detailing car. Well, for this one, you just need to try it to fully experience how fantastic this product is. It is made up of 100% Hyosung South Korean split microfiber which is considered to be the highest quality of microfiber available. Imagine that, microfiber is already considered the best fabric to use but this is another level of it entirely. The PLUFFLE is an exquisite towel that every car collector and auto lover needs to add to their detailing process if they want only the best and most luxurious care for their ride ever. It is made up of a 70/30 blend of up to 400,000 individual microfibers so you know that it will give only the gentlest wipes to your precious paintwork. Not only that! Its plushness allows it to pick up more dust and dirt than its average contemporary. Plus, it’s incredibly durable and will only get softer with every wash. Still in doubt? Try it to believe it! If you want the more popular brother of the PLUFFLE, this is the one to get. Dry Me A River Jr is not only a funny name, but it also does an excellent job of drying your car effortlessly. In all honesty, The Rag Company isn’t a well-known brand but it deserves a lot more recognition than the one it’s getting as they are continuously putting out products that perform really well. This towel might be the answer to their problem, as it is their most famous product as of now. With good reason! The Dry Me A Rive Jr is a fantastic choice for a car drying towel because it isn’t lying about being premium. It actually works amazingly! It is made up of a great 70/30 blend which is one of the two most effective microfiber blends. This means its created with 70% polyester and 30% polyamide. While most microfiber cloths have about 300,000 fibers per square inch, this one has a huge 100,000 difference. With 400,000 fibers per square inch, you know that you’re getting real value for your money. It is also created with 100% Hyosung South Korean microfiber. It won’t be surprising if this towel becomes a cult classic in a few years. You need to try it out before then definitely! 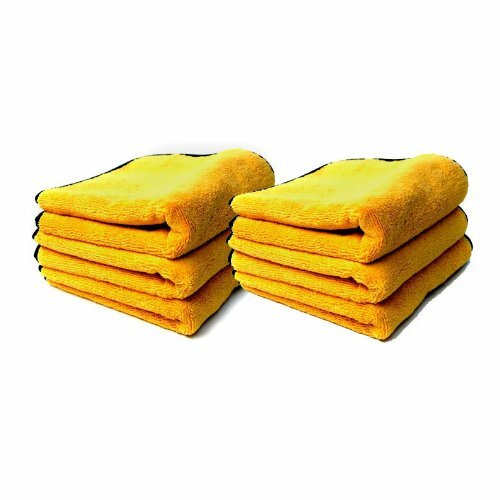 Although microfiber towels are gaining popularity of late but there are still many detailers prefer to use a chamois cloth to dry their vehicles. However, a good chamois cloth can be expensive but not for the chamois cloth from CleanTools. This synthetic chamois not only can perform exceptionally well but best of all the price is very affordable. Unlike many of the other cheaper chamois, this one can be machine washed and is resistant to mold, mildew and other reactions. This particular model is nicknamed “The Absorber” is very popular among detailers. 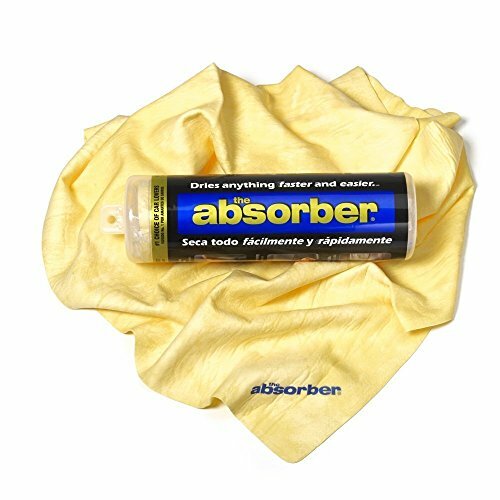 Overall, The Absorber is one of the best chamois for drying cars and it’s available in 6 different colors. The towel measurement is 27 x 17 inches. Read more of the product review, here. 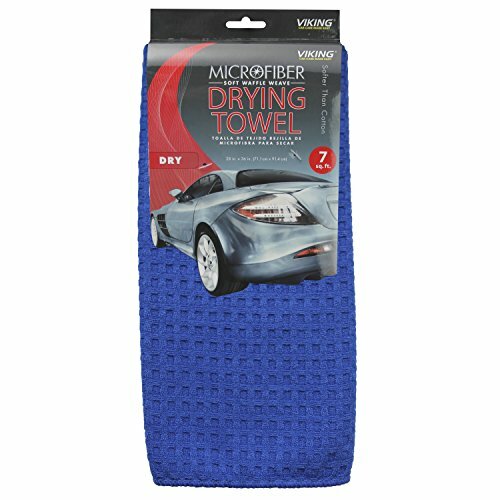 If you’re looking for a cheap but still a decent piece of car drying towel, the Viking Car Care Waffle Weave Drying Towel is a perfect match. 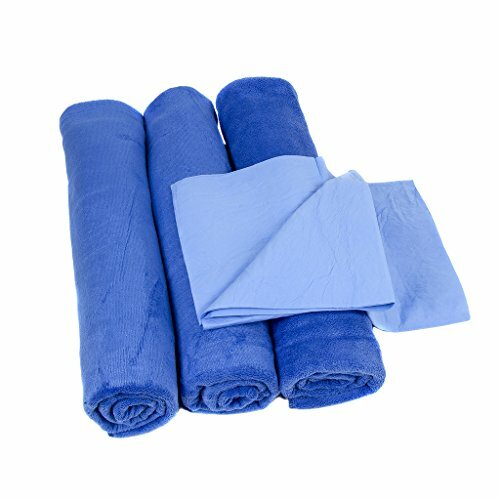 This 28 x 36-inch drying towel is one of the best towels to a dry car and the price is ridiculously cheap judging from the quality that this towel provided. The micro-bead action and the lint-free feature ensures that no streaks, water spots or scratches are left when using this drying towel. It is also machine washable and the waffle weave design made it dry up easily after wash.
Also, due to the waffle weave design, this towel can absorb up to 3 times its weight in water. Overall, this waffle weave drying towel is an excellent product at a cheap price. If you’re thinking of replacing your old and dirty drying towel, this is the good drying towel to give it a try. You’ve probably encountered microfiber cloths a lot when it comes to car detailing. It’s hugely present in most hardware stores and auto shops. You can also read it quite a lot in detailing articles and forums. But what is a microfiber cloth and why are people going crazy over it? Microfiber is a type of fiber that’s approximately about 1/100 of the diameter of human hair, making it very fine. It is highly absorbent as well. The reason that many enthusiasts and car professionals love microfiber cloths is that they provide gentle performance so your ride wouldn’t be riddle by ugly imperfections like swirl marks and scratches. When you experience a microfiber wash, I doubt that you’d want anything else for your beloved vehicle. This type of cloth offers high performance like no other and comes in different varieties. 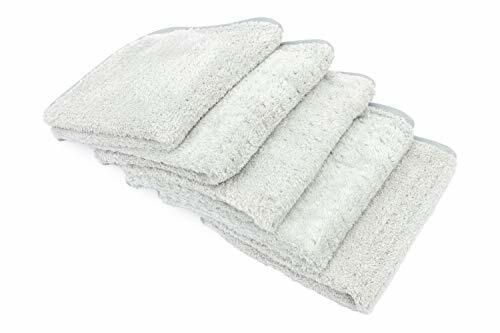 It’s possible to get a whole auto towel set made up of microfiber, from washing mitts to RV cleaners. They’re also great at drying. Varieties like the waffle weave can absorb more water and will require lesser ring outs than regular microfiber towels. When it comes to car products, microfiber is a go-to of many auto connoisseurs nowadays. The high demand for this type of towels prompted companies to create lines that are not only good for drying but amazing for washing and waxing as well. Although the market’s enthusiasm for microfiber is at an all-time high, a lot of products remain average in quality and premium ones remain lacking. This is what encouraged a German detailing company to create their own line of microfiber towels that will fit their needs and the needs of many detailers around the world. Microfiber Madness is then established. They are now one of the most sought-after brands in the United Kingdom because of the first-rate quality and innovative designs of their products. From an everyday wash mitt to special RV cleaners, they have it all. If you want to level up your detailing game, you will definitely need a Microfiber Madness product in your arsenal. Read this post for the product review for the Microfiber Madness towels written by us. Regular car owners think that a waffle weave is different from a microfiber towel. But that’s not entirely true. In fact, the waffle weave is just another variety of microfiber ones. Regular microfiber towels perform great when used in your car wash routine as their ultra-soft fibers wipe gently on your finish, leaving no ugly imperfections behind. Microfiber towels are also great for removing waxes, polishes, and other detailing products from your coat because they can glide smoothly on surfaces. The weave on the waffle variety is created for better drying performance. It is still created with microfiber so you know that it won’t scratch your paint, but it retains a lot more water than its regular counterparts. So remember, use waffle weave for drying and regular microfiber for everything else. Read this post written by us to learn more about waffle weave microfiber towel. When it comes to car drying towels, two types stand out more than the rest. Those two are chamois and microfiber. For the longest time, chamois ruled this category because of how convenient it is to use. But modern innovation gave way to microfiber. When it comes to being water absorbent, chamois remains superior to microfiber. It can easily hold the equivalent of 5 towels. It can also dry your car gently so as long as you use it carefully. You can also choose a more environment-friendly option if you get a leather chamois. Since it comes from animal leather, it’s a naturally renewable source that does not affect the environment as harshly as man-made varieties. Microfiber, on the other hand, is more easily accessible and less expensive. Buying high-quality microfibers is lighter on the wallet than high-quality chamois. It is also effortless to maintain as most microfiber cloths are machine washable. Microfibers are also known to be gentler on your ride’s paintwork and are very easy to use. Read this post to learn more about the difference between chamois and microfiber towel. The chamois cloth (a.k.a Shammy) has been used as a tool for various cleaning tasks because of its soft and quick dry properties. Shammy towels have two main types: leather and synthetic. Leather chamois is a naturally renewable resource that comes from a sheep’s skin. Its material is breathable and is excellent in absorbing moisture. Another type is the synthetic chamois cloth. This is made up of rayon or polyvinyl alcohol (PVA) which can absorb more moisture than the leather chamois. Both types can prevent you from putting any scratch on your paint. It can also be wrung out very easily which makes them an excellent drying accessory for taking care of your car. Sometimes you’ll see a product on the shelves that look like chamois cloth but is named ‘shammy.’ They’re just the same cloth. Shammy is the more informal term for chamois. In the early days, Shammys were made of chamois (sham-ˈwä) skin, an animal similar to a goat that’s found in Europe and western Asia. Before using chamois for the first time, you’ll have to prepare it first. If you buy natural chamois, it is usually coated with oil to help retain their high absorption qualities and to keep them from drying out. So the very first thing you need to do is to rinse off its excess oil. Wash your cloth in warm, soapy water. Don’t use dishwashing soaps or laundry detergents as they can strip off too much oil. Removing too much oil will dry your cloth a lot and make it too brittle for use. Mild soaps, especially auto formulated ones, are highly recommended. Turn the cloth a few times to spread the soap evenly. Next, dump it into clean rinsing water to remove the soap and all its excess oil. Rinsing it thoroughly is essential if you want to ensure that it remains super clean. Once you’re finished, hang it up to dry somewhere that allows it to retain its natural shape. You will notice that once dry; the cloth will become really hard. This is because it can repel water so efficiently. When this happens, just wet it again before use. Remember to wet it thoroughly as a hard shammy can cause scratches to paint. Here’s a more detailed guide if you want to learn more about how to use your chamois cloth correctly. Washing chamois cloth is easy, and you’ve done it before if you’ve already used your new shammy. Cleaning requires the same steps as preparing your chamois for its first ever use. So, it’s a good idea to familiarize yourself with that procedure as you’ll be doing it often. But sometimes those steps just couldn’t take out the dirty water from your chamois, no matter how much you wring it. That’s fine! A great way to get some tips is to ask people who are already familiar with the cloth. You can always ask your current detailer on how he cleans his shammy. But if you’re into a more passive approach, you can still get tips by going on online forums like Autogeek Online. There’s definitely a thread about chamois cleaning somewhere on the internet. Many auto enthusiasts from before and today still swear by The Absorber. It’s been a favorite among detailers and owners alike so you know you’ll get your money’s worth if you buy it. The Absorber is made up of synthetic varieties very much like PVA. It’s lint-free and resistant to mold and mildew if you take care of it correctly. So it’s a better alternative than using a terrycloth as your car towel. Plus, it can last you for years so you’re getting a truly great investment. It is also non-abrasive so you don’t have to worry about scratching your beautiful finish. Plus, The Absorber is machine washable, unlike other chamois cloths. You don’t need to think about the hard labor of cleaning up after your detailing project! You can use it on your other vehicles and not just on cars. Boats, motorcycles, and motor homes will also benefit from the amazing drying properties of this towel. You can even use it around the house to clean up table spills and messy counters. You can easily buy The Absorber towel from Amazon. Whether it’s as easy to wring out as chamois or not like regular microfiber, constantly drying your towels can be a pain. Think about all the effort you put into detailing your whole car. Wouldn’t you like it if you can make it a little bit easier for yourself? Buying a tool that guarantees less work for you is something that you’d really want to try! 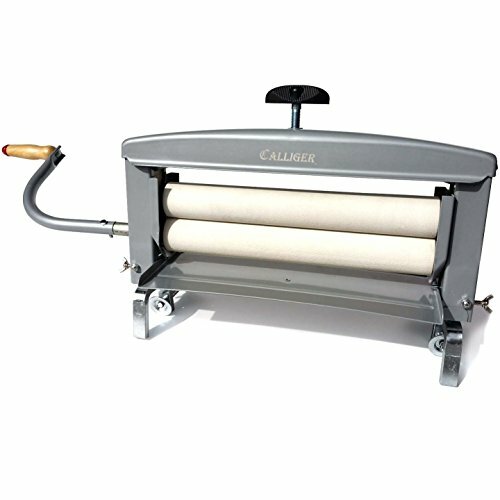 This Calliger clothes wringer is the perfect solution for your drying needs. You can put your towels here when they’re super wet and just easily turn the knob to crank it dry. You’ll be saving yourself a lot of effort as well as keeping your hands and wrists safe from possible medical conditions like tendonitis. Plus, you don’t even have to stick with just auto tools. You can also use this hand-cranked wringer for hard to dry clothes like denim pants. This machine will definitely lessen drying time for you! Like the product above, the DynaJet wringer will make your detailing projects easier by a clear mile. If you want to experience a powerful performance from your towel wringers, this is the product for you. It can wring out as much as 90% of your towels accumulated water. That’s an admirable feature as manual wringing would not get your towel as dry as this machine can. You will definitely be cutting off a significant amount of time from your overall detailing. By doing so, you can focus your time on more important steps like buffing your car or cleaning the car interior more thoroughly. This wringer also works well with wash mittens and sponges so you’re in for a quicker and simpler clean up! Of course, there are other types of towels that can assist you with your detailing project. If you’re on a tight budget, it’s perfectly acceptable to use your old Egyptian and Turkish cotton towels at home. Why only Egyptian and Turkish cotton towels? Well, because they are the softest and won’t leave ugly swirl marks on your car’s paint. While they may have been your best bathroom towels in their prime, these luxury cloths are also good alternatives to auto towels. However, bathroom towels are not as gentle on your car’s surface and may scratch your paint if you’re not careful. To find out which are the best bathroom towels to use, read this post. Huck towels are also common alternatives to chamois and microfiber. In fact, some auto shops actually buy huck towels rather than the two more popular towel varieties. They are equally durable and they perform great as well. These lint-free car drying towels are also great for glass care and window washing. Huck towels are also commonly used as surgical towels. For hygienic purposes, they are disposed after use and sold for non-medical purposes. But don’t be afraid to purchase reclaimed huck towels, they have been washed thoroughly and are super clean. Learn more about huck towels and why it’s an excellent option for your auto detailing project. Another type of towel you can use as a good alternative to microfiber and chamois are sponge cloths. This is especially true if you want a product that is both environment-friendly and inexpensive. Sponge cloths are made of biodegradable ingredients such as cotton, cellulose, and mirabilite. 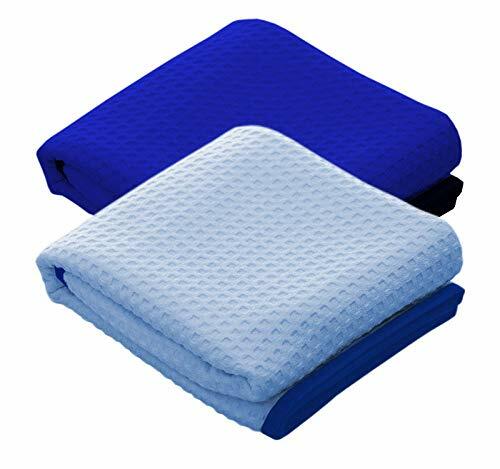 The combination of these three makes them a highly durable and very absorbent product. A sponge cloth can easily absorb up to 20 times its weight in liquid but easily wrings nearly bone dry, minimizing bacteria and mildew growth. And best of all it can be machine-washable up to 300 times. Sponge cloths can be used for many cleaning activities. Although it’s commonly used for house cleaning including on sinks, stainless steel appliances, granite, glass, mirrors, TVs, fixtures and more but the small size is perfect for car interior detailing but might not be the best choice for exterior though. Sponge cloth is excellent at picking up hair and makeup as well as other dirt, dust, and grime. You can use pretty much any cleaning product with a sponge cloth, including dish soap, disinfectant, car soap, wax and polish or your favorite household cleaner. To keep your sponge cloth clean, microwave it for 30 seconds to sterilize it, or leave it in the top rack of the dishwasher or the washing machine. Chamois Cloth vs. Microfiber Cloth: Which Is Better For Car Detailing? Why is Microfiber Madness the Best Car Detailing Cloth?